Bury Playgroup is a registered charity and is managed by a Committee of parents. All parents are more than welcome to join the Committee and help us to manage and develop the Playgroup. Ofsted monitors our Playgroup, its learning environment and curriculum. Please see the notice board or the Ofsted website to view our latest Ofsted report. Children learn through themselves, their environment and the interactions they have with the adults and children around them. We offer a holistic approach for children considering each child’s intellectual, social, artistic, creative, physical, and emotional potential. Children will observe investigate, explore and question when they are interested. We believe children use play as a learning tool to help reinforce and explain the ideas and experiences they have. We offer a balance of child led and adult initiated activities and have a wide range of resources to help support children in their play and development. Children of the same age have a range of abilities and learning styles; therefore should be treated as individuals based on their own unique characteristics. By giving children the chance and encouragement to do things for themselves we encourage independence in a safe and inclusive environment, where they know there is support if needed. We offer free flow inside and outside activities, snack time and activities to promote independence and self-choice. This helps build their confidence and self-esteem. The children are encouraged to value themselves and others and are supported as they start to play and work as part of a group. By observing children we can plan activities and resources around their individual interests and needs. By evaluating observations and asking parents/carers for their views, we are able to complete individual learning journeys for the children. These plans are used alongside their starting forms, observations and next step records, to establish if they are achieving and making progress to their early learning goals. At staff meetings we reflect on the activities and resources that have been offered over the previous week. We evaluate what went well and what could be improved, this information is then used to inform future plans. Children within the setting are engaged and confidently move freely around the setting, asking for help when needed. Their social skills are developing as they are happy and helpful to each other. Every child has the opportunity to reach their full potential and to make a positive difference to the lives of every child who attends Playgroup. We take children from two years of age. Our policy is to accept children for a minimum of two sessions a week – this makes a regular routine for your child and helps staff and peers to get to know him/her too. We register and book sessions for children primarily by date of birth. Please see our admissions policy for further details. Please note your child does not need to be toilet trained to attend Playgroup. In order to feel free to explore and experiment with all types of activities, including messy ones, it is best to send children dressed in clothes that are easily washed and not too new. Simple clothing with fastenings that they can manage themselves will help them to become more independent when going to the toilet or putting on and taking off outdoor clothes. Please ensure you send your child in appropriate clothing for the time of year. We have a supply of spare clothes, but it would be helpful if you could bring in some clothes in a named bag in the case of an accident or spillage. A healthy snack for all children to share. This could consist of a small portion of fruit (fresh or dried), vegetables, bread sticks or crackers. ​A completed registration form is needed when you wish to register your child at Playgroup. These can be obtained from Playgroup. We also ask for a piece of ID (e.g passport) for the future funding applications. We are open Monday – Friday term time only. The morning Playgroup sessions run from 9.05am to 12.05pm. This is for all children while the afternoon sessions run from 12.05pm to 3.05pm. 12:05- morning session ends and afternoon session starts. Please telephone the Playgroup in an emergency or if someone else will be collecting your child. Please be punctual collecting your child at the end of the session. ​All three and four-year-olds can get free early education or childcare for 15 hours a week during term time for (38 weeks per year) and for eligible families up to 30 hours. Please ask for more details if required. We will give out forms to all parents of eligible children at the appropriate time. The claim forms will need to be completed each term. Funding can be split between different settings for flexibility. Applying for the 30 hours funding is your responsibility. You must apply by the end of each term (31st December/31st March/31st August). You need to renew your application every three months, check your expiry dates and re-apply. Ensure you pass your code to Playgroup as we cannot apply for funding if the deadline has passed and we cannot back date funding. 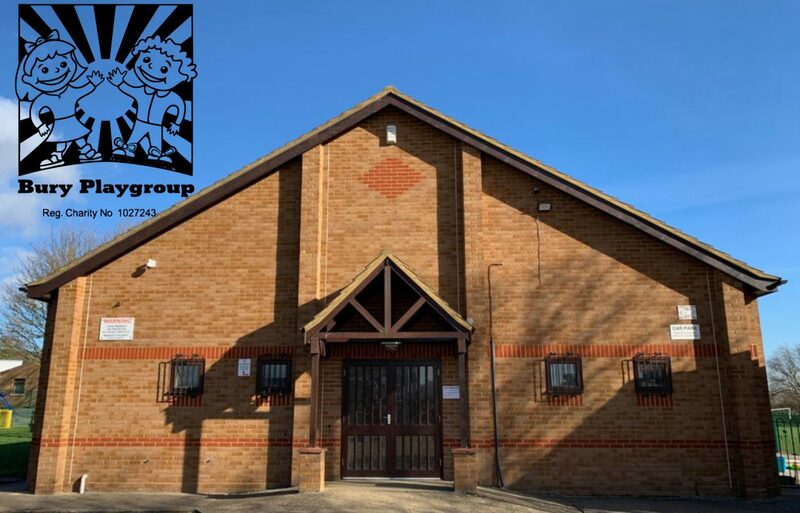 The Playgroup runs independently of Bury C of E Primary School, however our close ties with the school enable us to give our children many opportunities that would not normally be open to them. As part of the transition process the Reception team visit Playgroup, the children visit the school classroom and playground environment. This is very important in easing the transition from a playgroup to school environment. If your child becomes ill at Playgroup we will telephone the contacts listed on the registration form in order, and ask for your child to be collected as soon as possible. If your child needs to take medicine such as antibiotics or inhalers while at Playgroup we ask parents/carers to fill in a consent form. Please note if your child has had sickness and /or diarrhoea we request that you keep him/her at home for 48 hours from last episode of illness, to lessen the risk of infection. Also, if your child has a temperature and needs medication e.g Calpol, they are not considered well enough to come to Playgroup. In this case we require that you keep you child off Playgroup until they are well. If your child has an infectious illness [such as chicken pox, impetigo] or head lice please inform us so we can let other parents know there is a case at Playgroup. This is so they can be made aware and we will deal with this anonymously. Please also ask for the period of exclusion from Playgroup needed, if applicable. Please refer to our Health and Hygiene policy for more information. We help all children, as needed, to use the toilet but we do try to encourage independence at all times. Also we would appreciate it if children’s shoes had velcro or buckle fastening rather than shoe laces – again to help promote children’s independence. ​We use aprons for painting and gluing but occasionally clothes do get marks on them, so please do not put children in their best clothes. We always try to use washable paints and glue. ​You may like to have a Playgroup polo shirt or sweatshirt for your child – these can be purchased from the Green school shop in Ramsey. Every child is assigned a key person with whom both yourselves and your child can build a special and important relationship. Your key person will work with you to plan for, care for and provide feedback about your child’s development. We pride ourselves in having excellent parent partnerships, working alongside you for the best possible learning outcomes for your child. Throughout their time at Playgroup your child’s progress will be tracked across the areas of learning. This will be monitored to ensure they are making good progress which will be regularly shared with you. Parents and guardians will receive e-mails with the latest newsletter, with details of events, news, fundraising, and other information is posted on the website. ​We welcome all feedback from parents. ​Please feel free to talk to Kathryn Arthur (our Playgroup Manager) or any other member of staff if you need information or help or advice regarding your child. All matters are dealt with in the strictest of confidence. ​We aim to have a friendly, professional relationship with the parents and carers of the children in our care. As a Playgroup we aim to include Parents/Carers as much as possible. We have regular play weeks when Parents/Carers can see their child with their peers, observe their developing friendships, chat to the staff, speak to their child’s keyworker etc. Fundraising is extremely important for Playgroup. As a charity regular fundraising helps to enrich our provision. Bury Playgroup is a registered charity and is managed by a Committee of volunteer parents. All parents are more than welcome to join the Committee and help us to manage and develop the Playgroup. Parents/carers are also invited to attend the A.G.M. – held in the Autumn term. It’s an opportunity to find out about the past year, chat with staff, and to either join the committee or offer support in other ways. Please do ask if you would like to join the Committee.